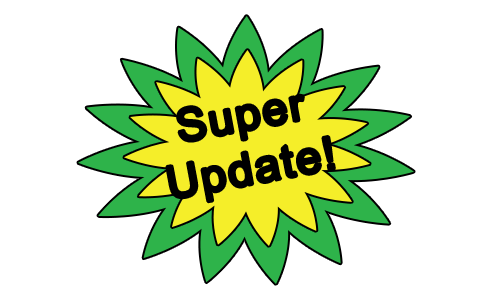 11/20/15 – Update v6.0 New DLCs, New Tools, Infinite Spawner & much MUCH more! This is a HUGE update and we hope you enjoy all the new features and goodies we’ve added. Like the new infinite spawner! Put an object in and now you can see what’s in the bag and only that object can be in it. Expect to see some cool animation effects on it in the future. Special thanks to Vermilion Wlad for making this for us. The new tools includes the Gizmo tool which allows you intricately move and rotate objects as you are trying to create your scenes. A text tool has been added so you can now write on any locked object. And what else can you do? You can now change the position of the card hands! Additionally, this update includes a brand new DLC – Euphoria by Stonemaier Games, the first expansion to Cosmic Encounter, Incursion and Superfight’s Orange Deck is now available for purchase. 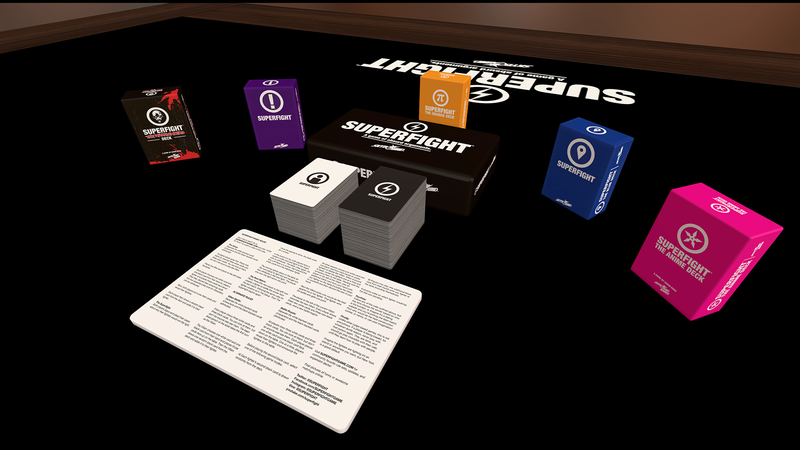 In regards to Superfight, we’re happy to announce that the price has been lowered to $7.99 and only the host has to own it. This means we removed the individual and upgrade options, so now it will work like all our other DLC. Those who had purchased Superfight before the change will be getting The Orange Deck for free. Old DLC saves will no longer work, due to our revamp of downloadable content. Sorry! Happy Autumn and Happy Thanksgiving to those who celebrate! Euphoria is available for $7.99 and only the host needs to own it. Euphoria has a launch discount of 30% off! This is a 2-6 player game at approximately 1 hour play time. 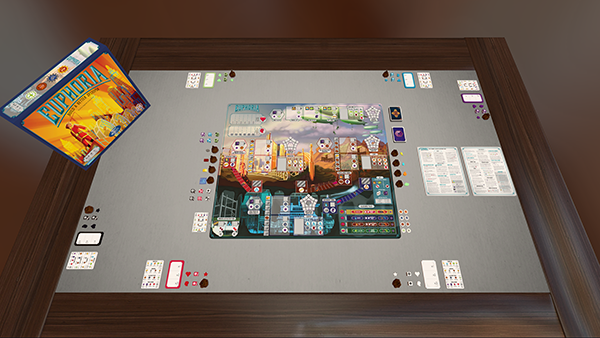 Find out more & purchase the physical copy on Stonemaier Games’ website. The first expansion of Cosmic Encounter – Incursion is now available for $2.99. Incursion adds a 6th player, 20 new aliens, and a rewards deck. 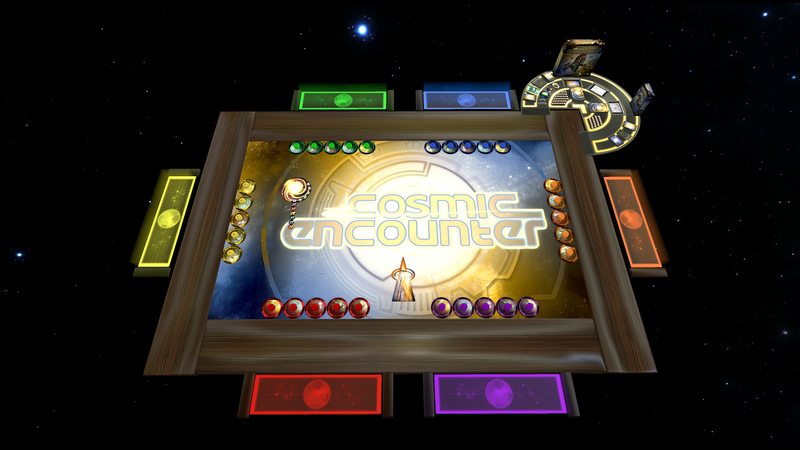 Cosmic Encounter has been revamped with a new layout and cool new side tables. You must already own the Cosmic Encounter Connector DLC to play Incursion. The Orange Deck is now available for $1.99. The Orange Deck adds one hundred really geeky cards to Superfight. You must already own the Superfight DLC in order to use this deck. Superfight’s price has been lowered to $7.99 and only the host has to own it. Those who had purchased Superfight before the change will be getting The Orange Deck for free. In the Zones menu, there is now an option for “Hands”. Clicking on this will bring up the placement of the current card hands. Right click on a color to change it which is great when you need a color to be in a different spot than default. Clicking on a color will delete that card hand. Dragging anywhere will create a new card hand of whatever color you are current set at. The player name will follow where the card hand is placed. You can have multiple card hands of the same color – the name will only show up on the first creation. This is great for private deck searching or keeping cards in the middle hidden from certain players. Added rotation snap in the “Points” section of the side menu. You can now customize where objects should be pointed. Place down a rotation snap point and use the arrows to point where you want the object to be positioned. This will make building games with more intricate placement much easier. Check out the following gif to get a quick look at how it’s done! A new Gizmo tool has been added to the side menu. This tool is familiar to those used to modeling programs. This enables you to move and rotate objects to precisely get things how you want in your scenes. Greatly improved the loading of custom content. Fixed some texture issues when loading custom content. Fixed weird texture resizing issue. Unfortunately, we couldn’t get the above issues fixed for our Mac users, but we are working diligently to get this completed in a future update. New Text Tool added to the side menu. You can use it to type text on any locked object. This is good for when static objects need to be named, but you don’t want to use the name/description boxes. There will be additions/improvements added to this in the future. Check the following gif for a quick overview of how it works. Rules have been improved to add different sections. By default each player can see the rules tab and their specific color. Teams can view each other’s tabs. You can change the color of your personal tab and rename it whatever you’d like. You can create new tabs by clicking Add New, then click on it and click the Visible button at the top to change its color. This allows you to have multiple “pages” for rules, private notes, team notes, etc. Something we know you all wanted has been added – a bowl. This is just a generic, wooden bowl and can be found in the Misc folder in the Chest. You can put all kinds of things in this bowl – coins, chips, blocks – whatever you’d like! Optimized the UI for improved scrolling in the Workshop, Save, Load and Saved Object lists. Moved player name section over to the top right. Moved the rewind button next to the top menu bar. Side menu has been moved up to where the player names were. Added Gizmo and Text Tool buttons to side menu. You can now stack custom tokens. Just check the “Stackable” box. Improved Calculator sequence so you can add numbers up just as you’d expect. Improved the sounds for custom board objects. Increased the size of snaps points for better readability. You can now slice custom cards that is not like the default template of 10×7. In the custom deck menu, you can change the width and height of the template. Improved Custom chip stack thickness when a collider is provided. Ambient Occlusion has been added to the Configuration/Graphics menu. Just look for SSAO, which adds soft shadows to the scene. Improved the visibility of object highlighting. Expanding a save now works with bags, chips, dice, and tokens. Added sounds to all boards when picked up. Improved default camera position for colors. Fixed collision issue with right click grabbing multiple objects. Fixed issue with custom mass values being reset to defaults. Fixed issue with non see-through Hidden Zones not working for everyone. Fixed an issue with certain objects not stacking. Fixed issue with the 3d hand holding offset. Fixed issue with some graphics settings not persisting when exiting to the main menu. Fixed issue with custom boards not being hidden by hidden areas. Fixed issue with zooming far away on the Tablet. Fixed issue with objects falling through each other when loading. Fixed issue with the bag bugging out with auto raise off when pulling objects out of it. Discuss this thread on our forums!